The name “kestrel” comes from the French crecerelle, which originally referred to a noisy bell or a leper’s clicket. When Eurasian Kestrels were kept in pigeon houses, their noisy calls apparently kept other hawks away. Migrating Habits: Like most falcons, kestrels do not take advantage of thermals nearly as much as other raptors. They are often seen following shorelines. In Duluth, kestrels are often seen in greater numbers at locations right next to Lake Superior than at Hawk Ridge. Nesting habits: Kestrels nest in old flicker holes and natural cavities, and sometimes in nest boxes. They usually have 4-5 eggs, which the female incubates for about a month. The young leave the nest about a month after hatching. Weight: Males average 109 grams, females 123 grams. In the world of raptors, females are bigger, stronger, and usually more aggressive than males. 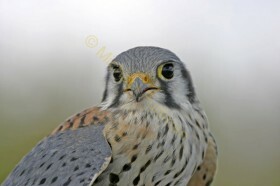 Life expectancy: Most kestrels can be expected to live little more than a year. Few live as long as 4-6 years, either in the wild or in captivity. Longevity records belong to two kestrels kept as pets that lived to be 14 years old and one to 17 years. One wild banded bird survived 11 years, 7 months.